Do You Need A Registry Cleaning Software For Windows? Does your PC slows down, freezes, crashes or give error pop-ups? If yes, your computer’s Windows registries need a repair. Such system issues make your computer difficult to use and hence must be attended immediately. In Windows, registry issues happen over the time due to uninstallation and deletion of files and programs or modification of location of files. These issues can be fixed manually (requires expertise and hard work) or with the help of registry fix software. However, to know how to fix a Windows registry, you need to what a Windows registry is. We will eventually come to the topic that whether you need a software to fix Windows registries. What Is a Windows Registry? 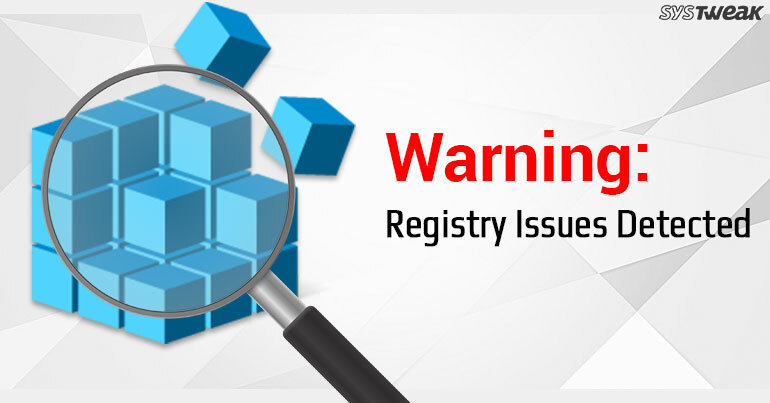 Windows registry is a database created by Windows to store all the details about the applications installed on your computer. The details include file extension associations, program settings, desktop background etc. HKEY_Local_Machine- includes settings for installed applications, operating system and hardware. HKEY_Classes_Root- contains OLE information and file associations. HKEY_Current_User- consists of preference for current users. HKEY_User- has details about each user in the computer. Installing a software on your computer adds data to Windows registry database. You can access Windows registry database by typing “regedit” in the search menu. Now, it’s important to understand that modifying registry values can hamper computers operations. It can even stop your computer to start. Hence, it’s advisable not to touch them unless you are a system expert. That’s why cleaning Windows registry manually is not a good idea. Why Cleaning Registry is Important? Windows registry is a mysterious element of the computer. That’s why understanding it is important. However, there are many reasons why you should clean or fix your Windows registries. As discussed above, registries consist of information related to all the applications installed on your computer. These information are used whenever an action is performed on the operating system. Hence, if invalid entries are inserted into registries, it will affect your system’s performance. Cleaning registries on regular basis can save you from the hassle of system instability and improve your PC’s performance. Now as there are thousands of registries in the database, identifying the problem and fixing it manually can consume a lot of time. Moreover, handling registries is a critical process, thus it’s better to use a software to perform the task. There are many registry fix products available in the market but all of them might not suit you. Hence, it is important to understand the know-how of choosing the best registry cleaning software possible. Here’s how you compare the software. How To Compare different Registry Cleaning software? It is one of the most important things to look in the product. You can compare different products on the basis of their features. Don’t fall for senseless features and think whether the product meet your requirements. “Full money back guarantee” is a great feature that you can look for in the product. Manufacturers will never provide such feature if their product is bad. It is important to resolve your customer queries. Hence, the product must provide 24*7 customer service. You may come across situations where you need to contact customer service. Moreover, customer service should be included in the price of the software. Customer service must include both technical and customer support. You can hear what other customers say about the software. Read customer reviews and watch customer testimonials. They can certainly help you decide about the product. Visit review websites or blogs by renowned technology experts and hear what they have to say about the product. You can also look for the awards and certifications owned by the product for its performance. These points can be used to compare any software product. The aim of comparing products is to identify the best product in the market. The product will be responsible to improve your computer’s speed. Now that you know how to compare the products, here are some hand-picked registry fix software for you. You can compare them if you wish or just blindly choose any one. We assure you that they are the best you can get. The first software on the list is RegClean Pro. It is a complete registry fix software that easily enables user to scan, clean, schedule scans, optimize and defrag Windows registries. Its intuitive interface makes it a preferable tool for any user. It is reliable and contributes well to the smooth functioning of your system. RegClean Pro is compatible with all versions of Windows. Wise Registry Cleaner is an amazing registry cleaner that quickly scans and locates problems in the registries like missing references to application paths and shared DLLs and invalid entries related to files extensions. It scans, finds, fix and defrags registries. Your computer will be stay more stable after using Wise Registry Cleaner. In addition to cleaning, the software also optimizes system settings to increase system and internet speed. CCleaner is a small, easy to use software that single-handedly cleans registries and other privacy traces on your computer. The software is available for all Windows versions. You can get a quicker startup, fewer crashes and a faster computer with the help of CCleaner. It is one of the best system cleaners available in the market. Registry Reviver helps in streamlining and maintaining registries in Windows. It is quick to scan, easy to use and available in both free and paid versions like other products in the list. It is also available for all versions of Windows. RegistryCleanerKit is another great performer in the league. The user-friendly UI of the software enables you to easily access its amazing features. RegistryCleanerKit scans and repairs registries and prevents error messages and system slowdown. RegistryCleanerKit is compatible with all versions (XP, Vista, 7, 8, 8.1, 10) of Windows operating system. Comodo PC Tune-Up is a complete solution for clean-up needs on your computer. The tool scans and fix registries, removes junk files, fix Windows errors and optimizes boot time. It is a paid software but it’s worth buying it. Go for it! Use registry cleaning software to sustain your computer’s performance. This article aims to educate you about the importance of cleaning Windows registries. Hope it serves the purpose.